Our office appreciates the relationships formed with college representatives. 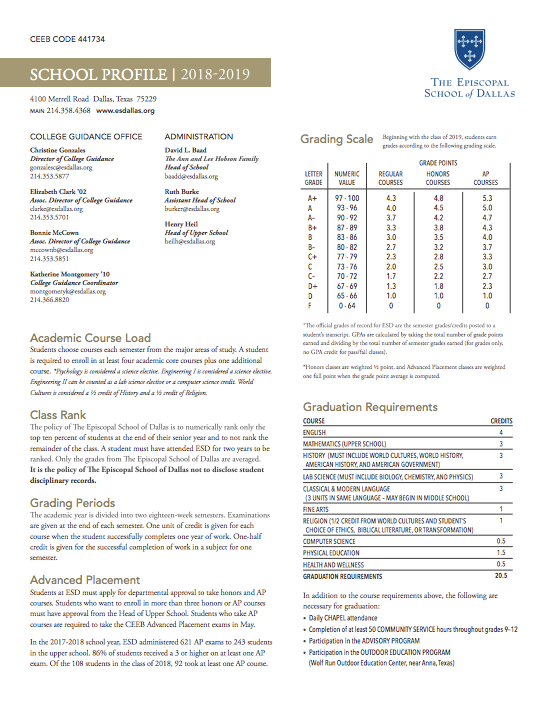 We welcome you to visit The Episcopal School of Dallas and meet with our students and counselors during the school day. If you would like to schedule a school visit, go to https://repvisits.com. For any questions about visits, contact Katherine Montgomery at montgomeryk@esdallas.org or 214-366-8820. College Rep visits typically last 30 minutes. We do not offer lunch visits. We are located on the Merrell Road Campus, 4100 Merrell Road. Please drive to the main gate and stop at the security booth for access to visitor parking. From there, please go to the main reception desk and check in to obtain a visitor badge.